At CSC, we have decades of experience investing in the way that best helps our members attain the retirement they deserve. Sovereign status - Our government association make us a very credible investment partner and increases the range of investment opportunities we are able to access on your behalf. Mid-range scale - Our funds are large enough to ensure you material cost savings. But they are not so large that we can no longer access the most rewarding investment opportunities or be nimble enough to manage your risks in a timely way. 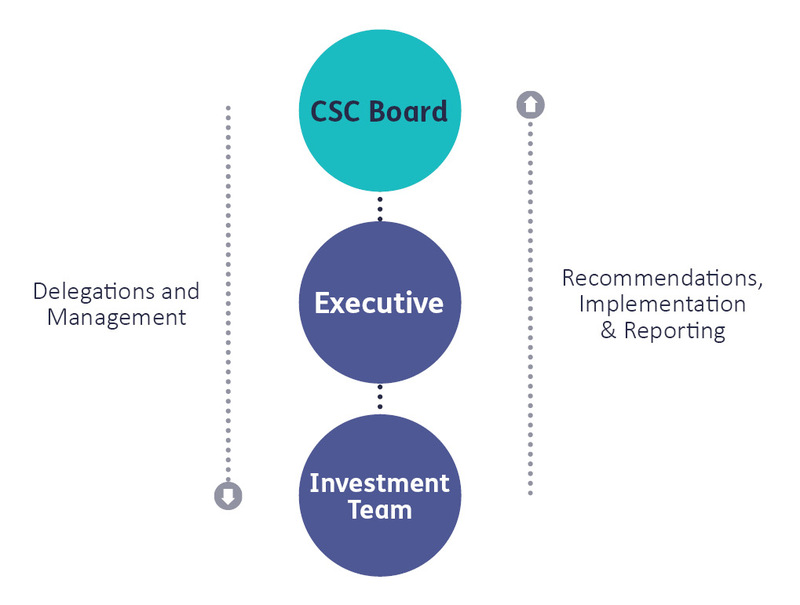 An experienced investment team - Our stable, experienced team of investment professionals are dedicated exclusively to CSC members, but linked into a global network of complementary, specialised investors. Long term view - We invest for generations of Commonwealth government employees and members of the defence forces. This means that we can generate the stronger returns that are available on high-quality private assets and strategies that are not available to investors who can only make short term investments. Well-defined member base - We are not here for everyone. We only focus on achieving the aspirations of current and former Commonwealth Government employees and members of the Defence Forces. Investment governance framework - To us, governance means making sure that the right investment talent is focused on making the right decisions, with the appropriate levels of risk, at the right time. Because of these advantages, we've helped generations secure a stable financial future. We believe that over the long term your retirement income will be maximised if your super minimises negative performance when markets fall but captures most of the increases when markets are rising strongly. This can be characterised as “winning by not losing”, and means your savings are safer during adverse market events. We succeed when you do, and here’s how we’ve done well together, even through the GFC. 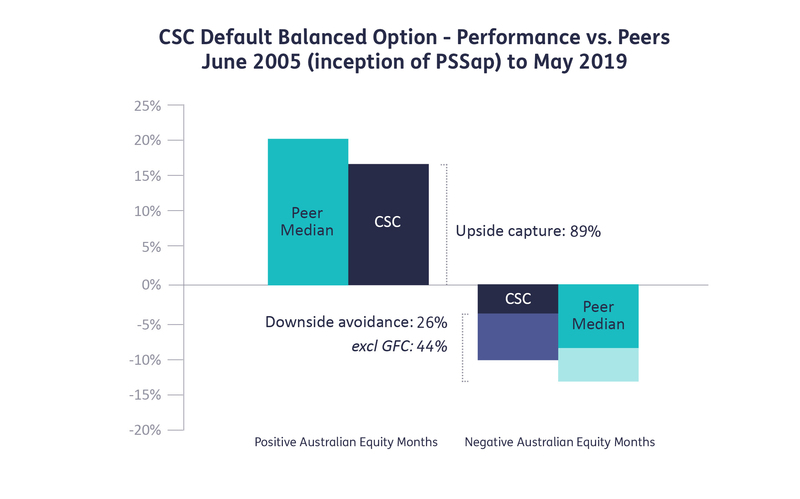 Over our entire performance history*, the CSC Balanced option has captured 89% of the positive returns generated by other superannuation funds during periods when markets rose. We avoided 26% of the losses generated by other superannuation funds when markets fell, even including the GFC. Excluding the Global Financial Crisis, we also avoided 45% of the losses of other superannuation funds. * Peers refer to the average return of the SuperRatings Top 50 super funds across government, industry and retail balanced default product. Your superannuation savings had no exposure to “collateralised debt obligations” through the GFC. These were synthetic, highly-leveraged financial instruments that were extremely popular immediately before the GFC but which failed catastrophically during the GFC. Your private markets investments (private capital, real estate and infrastructure) did not experience any permanent impairment of value through the GFC. Nor was there any liquidity requirement to sell assets at below fair value when they were under stress. Investment can be hard to understand. But we’ve made it simple. Here are the things we keep in mind when we invest your money, and how we’re able to deliver you the returns you deserve on a day to day basis. We make decisions in regards to investing your money with a few key beliefs in mind, helping us maximise returns, manage risk and secure your retirement. Protecting the value of our fund during market downturns results in higher returns for you over the long-term. Asset prices eventually revert to their true value but can be above or below that value at any point in time. We invest in 12 different risk factors, which appear in different combinations, and at varying cost, within a much larger number of asset types. Private assets provide an additional layer of returns to compensate for the fact that they cannot be converted to cash immediately. We think of governance as being a company’s capacity for strategic planning and execution, including a demonstrated awareness of the social licence to operate (long-term sustainability). Awareness of an asset’s environmental, social and corporate governance factors can reduce the risks associated with owning that asset. When we invest money, strategise for the future or deal with partners and members, we adhere to investment operating principles to help us make sure we’re doing right by you. We endeavour to eliminate unnecessary costs. However, while we prefer the lowest cost way of constructing your portfolio, we will use methods that are not the lowest cost, if doing so is expected to boost your portfolio’s return after costs, or lower the variability of returns. We focus on getting you the best return, after costs, per unit of risk. We focus on and prioritise investment opportunities that have the highest potential to materially improve your retirement outcome. We were the first Australian superannuation fund to implement a fully-integrated, portfolio-wide risk system that provides a consistent analysis of the key risks that matter for your total portfolio. This approach enables us to consider the complex interactions between asset-classes, and the evolving world in which they have to operate. We also established an Australian research house to provide us with rigorous, data on public-company governance and environmental and social risks so that we could assess their potential impact on the value of your investments. We partner with a relatively small number of specialist investors around the world. This enables us to structure our working relationships with their teams in ways that maintain alignment between those service providers and your requirements in retirement. We seek to be pro-active in the management of your investment risks. Our capacity to take decisions quickly is enabled by our robust and unique governance structure. Being nimble is important in dynamic markets. We actively take ownership of the investments we make on your behalf. At CSC, we aim to achieve your retirement needs, grow your retirement income and provide you with a high return relative to the investment risk we take for you. Our investment governance framework provides the guidance with which we can do this. Our investment governance framework enables effective decision-making and accountability, by the right people for each decision, and facilitates timely identification and management of risks. This is critical to the delivery of sustainable and robust investment outcomes for you. 2. Investment delegations operationalise the Board’s strategy and policies. 3. A well-defined control process enables the Board complete oversight against these delegations at all times. By investing in public and private corporations we aim to grow the real value of your savings. By investing in and operating property and infrastructure assets, we aim to protect against the risk of inflation eroding the real value of your savings and to provide diversification to the enterprise risk. By owning the debt of stable governments, we aim to protect your capital against adverse events like economic recessions. By pro-actively managing investment risks through the cycle across a wide variety of opportunity sets and in different economic environments, we aim to protect your capital, preserve your purchasing power, and grow the real value of your savings (in a way that is less related to the direction of the underlying financial markets). We pro-actively manage the foreign currency risk that comes with owning assets outside Australia. When constructing an investment portfolio for you, we take advantage of our long investment horizon to diversify across the many risks that you must be exposed to, in order to generate your required returns, with a reduced probability of loss. There are three things we keep in mind when we evaluate our progress against your retirement objectives. Your superannuation is a long-term investment that should provide you with financial security in your retirement, so our focus is on the income (allowing for the cost of living) that your superannuation savings will be able to generate for you when you retire. Shorter term returns or returns relative to other funds are relevant only to the extent that they could affect your expected retirement income. Measures what level of income your superannuation savings can generate for you in retirement compared with a common industry-wide benchmark of adequate retirement income. Investing means taking risks to earn a return. We endeavour to do this prudently by limiting losses in the value of your portfolio during times when markets fall, while capturing most of the gains available when markets rise. To achieve this, we diversify risks where we can, and reduce your portfolio’s dependence on listed equity markets to generate high returns. This is designed to benefit you with a competitive retirement outcome that is less dependent on the changeable global economic environment. We’re using our wealth and depth of experience to help you secure your retirement.